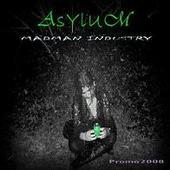 "Madman Industry" is an interesting study into the strange, twisted imagery that is Asylum. This band is aptly named; the songs are very weird in a sick way. That is both a good thing and a bad thing. The musicianship of the band is undeniable; they know how to put together a song and the sound is strong. Now for the negative: it sounds like the band is trying too hard to make a statement and the entire project suffers. The songs tend to be depressing and the world is too small for depressing music. Maybe if the band just relaxed a little and let the music flow, it would come out cleaner. For more information, check out http://www.myspace.com/Asylumcro.